Wonderful snow and ice shots. 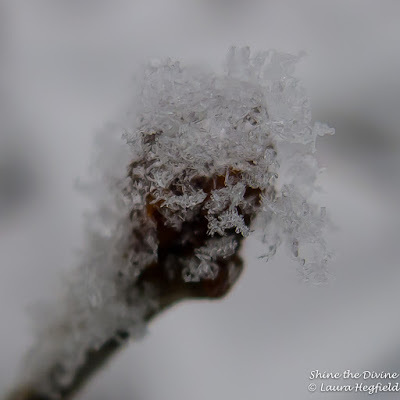 Stunning macro shots Laura and a sweet companion to guide you through the storm. Happy week to you my friend! It looks still very cold ! The macro is beautiful ! thanks for the amazing macro shots, I love it! In every aspect I see something like a delight for soul, but the golden light is my favourite...what sight!! Best regards, Laura, for you and whole family, in this month of february and always! I like your pictures and the atmosphere they convey. Wow....how beautiful! Love the spotty collar too. Thank you Laura for inspiring us. Beautiful macro photos, Laura. I love this post! Have a nice week, cherry! Hello, Laura! Your furbaby is so cute! What a great companion for your walk. I love the frosty images. Happy Monday, enjoy your new week ahead! That last one looks like an ice caterpillar. Right now the snow is the size of cornflakes, which makes me think about all the milk being sold at the grocery store so the kids who don't have school can have cereal in the morning. Sorry my thumbnail link got messed up. Great shots. 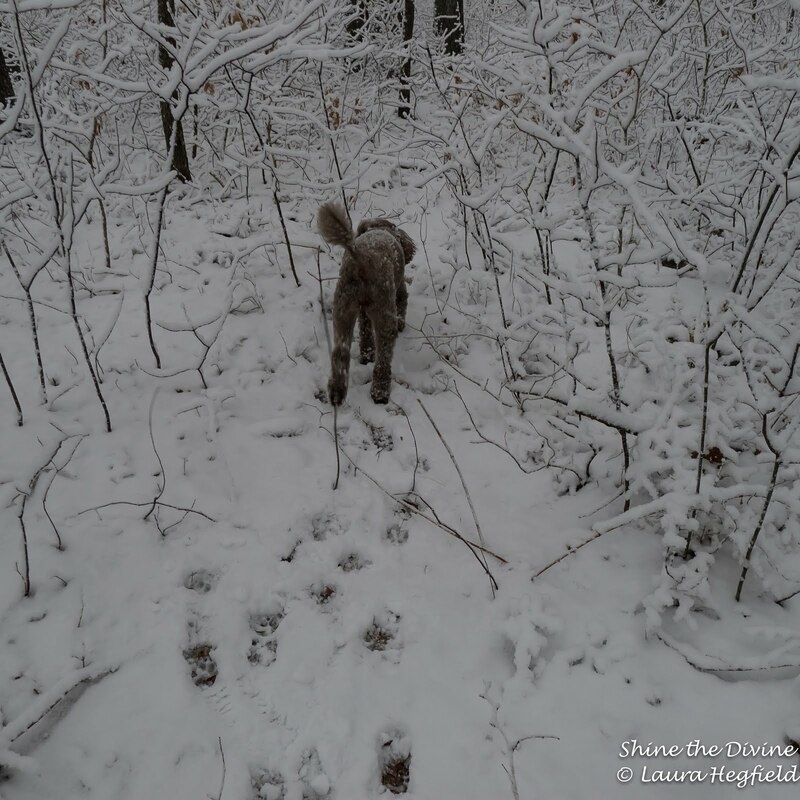 How brave is that doggie to go out and play in the cold. 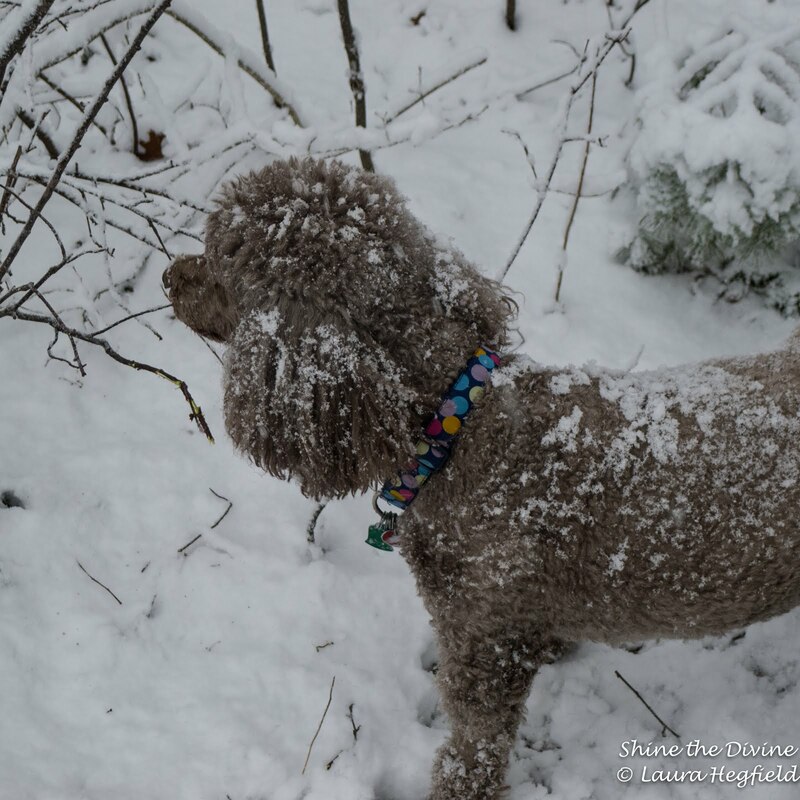 I love your poodle in the snow photos, Laura! 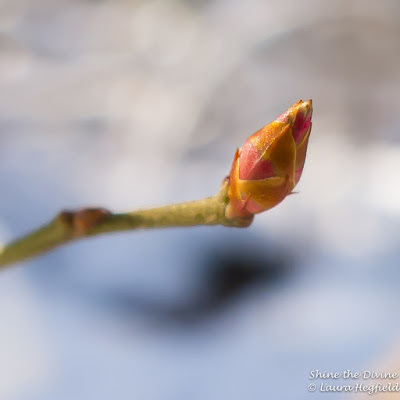 The ice and snow are really reigning at your house, I love the final bud full of hope and promise. 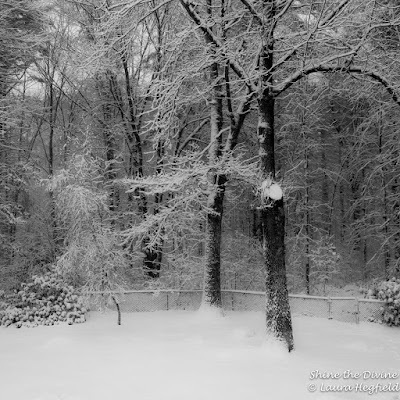 Those frosty images make me feel good to be here in Florida. Funny-- I grew up in New Jersey and loved winter, so everything is relative. My actual macro is the butterfly on my blog header, which does not transfer to Linky. Zoomed to eagle's head as a poor substitute. Super snowy shots! I love your cute dog! Hi Laura, how is your health going. I still keep you in y daily prayer. Love your wirer shots especially since I am melting in our continuing heat. 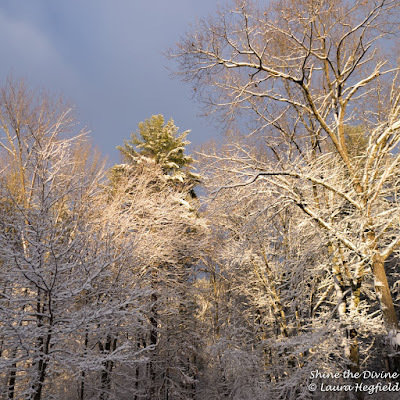 Beautiful images of snow and light and shadow. Your dog is adorable. 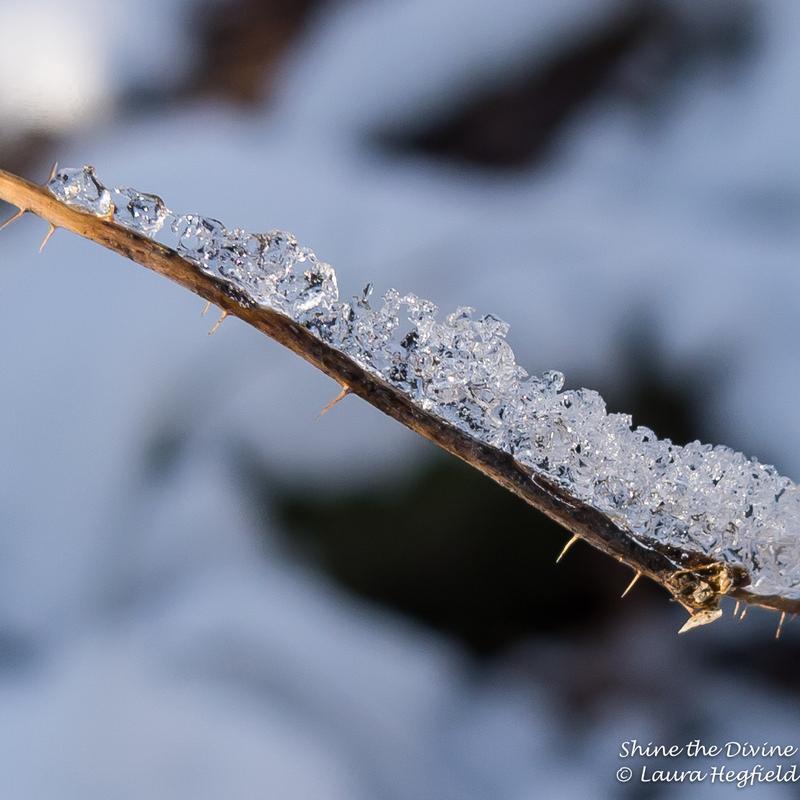 I love that shot of the ice crystals on the twig! It is SO good to see you again. It has been a long time. I have been doing a lot with my artwork and neglecting my posting. I am trying to put up one shot a day for 2016 but don’t know if I will make it. Love these macro sots. 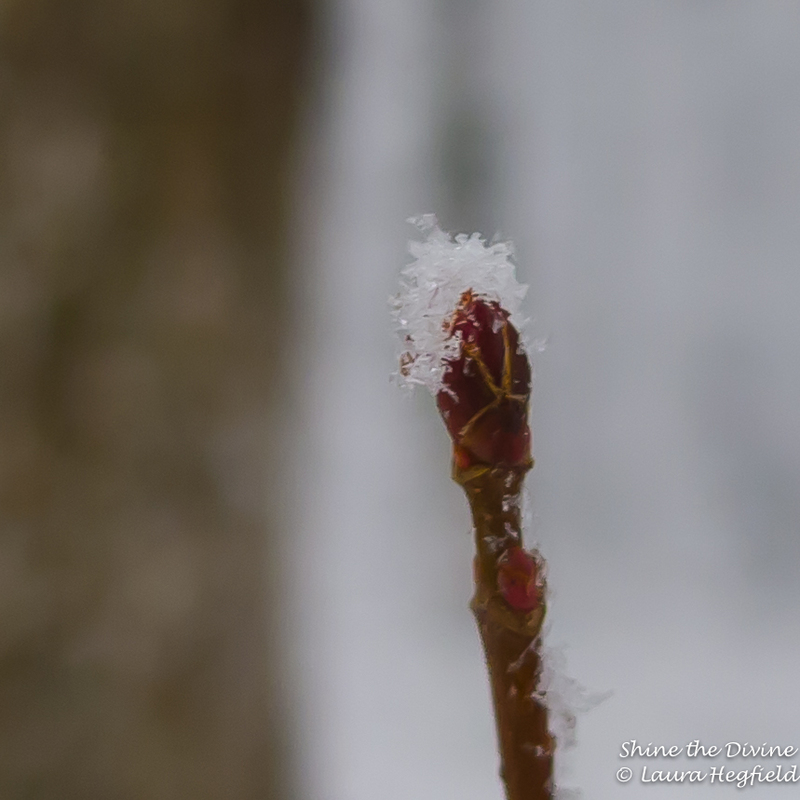 The bud in the last one is awesome, and the ice on that branch really reminds me we are in the heart of winter. Hope you are staying warm. It is very cold here. Added my name to your follower list. Do not know how I neglected to do that earlier. your photos are always so wonderful! We got more snow today. Has warmed up enough to melt it off the drive but it is still too cold! Have a wonderful weekend and Happy Valentine's Day! Again I am awed by your icy photography. Lovely! So many beautiful pictures here :) Love the snow..
Heisann, have a happy week, Laura! thank you for sharing your snowy adventure. glad your sweet friend was there leading the way!